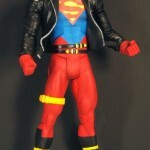 Still on the fence for DC Universe’s Wave 13? Check out the following videos by Pixel Dan & Scotty Cash to see which one of these will lighten your wallet. Will it be Cheetah, Superboy or any of the rest? Let us know on our boards. 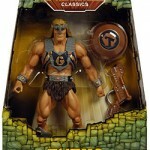 Pixel Dan again gives us a Masters of the Universe Classics video review for an upcoming figure: the heroic giant warlord Tytus! Although snatched up already by fans through an early batch distributed on Ebay (not by Mattel), it’s nice to see He-Ro’s buddy has finally made it into fan’s hands after waiting so many years. Discuss on the Toyark Forums› Views: 2569 › Credit: Eurocoin of the Toyark Forums! User age35II on Youtube brings us a video review for the recently released XtremeMemory henshin add-on from Kamen Rider W. All sound clips are shown and he goes as far to show its interconnectivity with the previously released Memory Gadgets and Gai Memories. 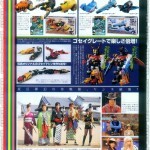 Figure King’s latest issue also brings interesting products for toku fans everywhere. Tensou Sentai Goseiger is present with two new Headder teams. The Seaick Brothers (Manta, Sawshark, and Hammershark) combine with the Dx Gosei Great to form Seaick Gosei Great. Landick Brothers (Kuwaga, Sai, and Tyranno) do the same to merge into Landick Gosei Great. Each team comes in a three pack including a Ganbaride card that can be used on the Tensouder. 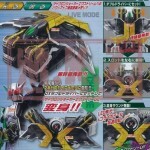 On the Kamen Rider front we have some new images of the upcoming RAH (Real Action Heroes) Kamen Rider Knight from Ryuki. Complete with his Dark Visor and Wing Lancer, Knight includes 6 vent cards. Check out the Digital Grade range of figures, Gosei Great Candy Toy, Figuarts and more by clicking above. 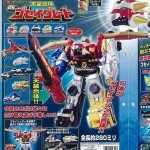 Born from the combination of Gosei Dragon, Gosei Snake, Gosei Shark, Gosei Phoenix and Gosei Tiger, Gosei Great is the mecha for the new Japanese tokusatsu television series Tensou Sentai Goseiger. Showing use the individual components and merging, user age35II has uploaded the following video on Youtube. Click on the embedded link above to watch the video. 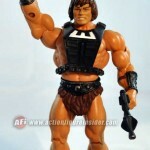 Available only to 2010 Club Eternia Masters of the Universe Classics subscribers, a Wundar produccion sample has been handed to AFI, who have shared an extensive image gallery. Due for release on the 15th of April, Wundar even includes a small Wonder Bread logo on his chest armor as well as the previously shown loaf. Pixel Dan brings us again the first in hand video reviews for the upcoming Masters of the Universe Classics Evil-Lyn and Moss Man figures. 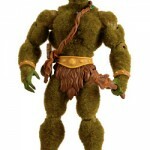 Moss Man will be available March 15th in flocked and un-flocked versions, while Evil-Lyn is expected to land on April. 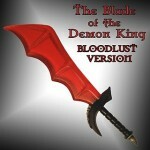 All will be sold exclusively on the Mattycollector website. Click here for the Moss Man review, and here for the Evil-Lyn video. Every year at SDCC we like to give the fans who make the special effort to come out to our fan panel a chance to vote on a detail in the line. At SDCC 2009 we asked fans if they wanted Panthor flocked or not flocked. By a vote of 60/40 (it was close!) fans did vote for unflocked. We know there is a video of this panel out there (granted it does not show the whole room!) and a lot of fans insist the vote went the other way. But at the end of the day, it did not. It really did not matter to Mattel which way this vote went. It was all about rewarding the fans who came out to the panel with a way to affect the line. I still see a lot of fans spreading false information and insisting the vote went the other way. So lets end this one right now. The vote was for unflocked. It does not mean we won’t do a flocked version as well, but whether you agree with it or not, this is just how the vote went, period. Discuss on the Toyark Forums› Views: 2603 › Credit: Eurocoin of the Toyark Forums! The Alien Creation Chamber Laboratory: This toy is the newest addition in a long line of “Alien Creation” toys for the brand that continues to boost design and invention skills by letting kids develop their own unique combination of aliens. Kids create these aliens by loading the lab with multiple arms, legs, heads and torsos, and with a push of a few buttons, a new alien comes together. Millions of alien combinations are possible. The Disc Alien Ultimatrix: This latest edition of the Omnitrix which is called the Ultimatrix comes with a disc-shaped alien hero that can be placed inside the Ultimatrix and activated to pop up bringing the alien to life. These Alien Discs come packed with select articulated 4″ figures. The Disc Alien Ultimatrix unlocks the alien voices of several characters from the cartoon, including Ultimate Spidermonkey, Ultimate Humungousaur, Ultimate Big Chill, Ultimate Swampfire, Nanomech, Amphibian, Armodrillo, Water Hazard, Terraspin and NRG. Lights and sounds help make the Ultimatrix come to life! The Mark 10 Deluxe Vehicle: The Ben 10 Deluxe Vehicle comes with lights, sounds, missiles and four vehicle modes: racer, hovercraft, submarine, and jet fighter. 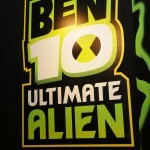 A specially designed Ben 10 action figure is included. Other 4″ Alien Collection figures can fit in the vehicle as well. Click above to view the mirrored image galleries and stay tuned to Toyark.com for our 2010 Toy Fair coverage, TFW2005 for Transformers coverage and HISS Tank for G.I. Joe coverage.